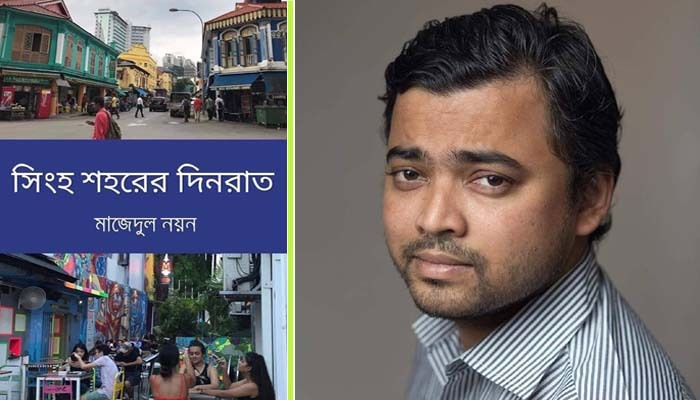 "Singho Sohorer Dinrat"—a travel log by Journalist Mazadul Noyon is now available at Ekushey Book Fair 2019. To commemorate the Martayr Day along with the international mother language day the book has been unveiled on Monday at ekushey book fair premises. Readers can collect the book from PuthiNiloy, stall no 301-03 at the book fair in Suhrawardy Uddyan. At 25% off the price of the book is set around Tk 200. Mazadul Noyon author of the book said, "Shingho Shohorer din raat" is my second travel log. These days we don't need to read travel logs to know far foreign place as internet have made us familiar with the whole world more or less. I would like to call my book a travel story where the stories are travelling. The book depicts the tales of migratory people in Island state Singapore coming from Asia and the rest of the world. Singapore, a state of multicultural community and people from different religion and beliefs, brought all under a single umbrella. In my book I tried to have a sneak peek in the peripheral lives of those people, how they mingle, how they lead life in the city of Lion. My stories portray the shiny Singapore and the dark part of it as well. The city has different layers which seems unknown to its dwellers. The eye of a journalist can sense it. This book will not teach readers, so those who read to acquire knowledge should not read. And those who do not read books must not. Only those who love tales and stories are cordially asked to read the stories those had roamed the alleys of Singapore for three long months. They are the true readers of "Singho Sohorer Dinrat". In search of raw and fresh news Mazadul Noyon has travelled across Bangladesh, likewise he has also travelled the south Asian countries. He has travelled the landscape as well intricacies of those countries with a sharp eye and evaluation mind. Mazadul has the experience of paragliding. He has made record a jump done from aircraft hovering at thousand feet altitude. In the year 2017 he composed a travel log "Without Borders", stories depicting his days in India and Bhutan. He started his journalism career at Bhorer Kagoj while studying in the Dhaka University.